Brand seeks customer. GSOH essential. The fintech company Revolut, which provides app-based current accounts has suffered a furious backlash from financial blogger Iona Bain of Your Money Blog as a result of its new advertising campaign. 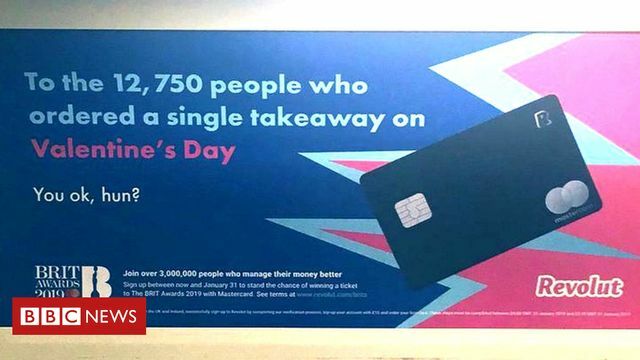 The headline of the offending posters say "To the 12,750 people who ordered a single takeaway on Valentine's Day....You OK, hun?" Ms Bain (for that is how the BBC describe her) tweeted today "How much does this ad infuriate me? Let me count the ways. Firstly, patronising language & awful single-shaming more redolent of early 2000s Bridget Jones, not a modern and empowered fintech brand." Single-shaming? Who knew that was a thing? As a married man and father of two teenage children I am rather jealous of singles. Anyway, single-shaming clearly now needs to be banned. We trust the ASA will launch a study into the issue of single-shaming ASAP, followed by research a then a consultation on a draft rule and accompanying guidelines. The new rule should be ready for implementation by no later than about 2023. Or maybe 2024. Disappointingly, Revolut appear to have responded in a rather conservative fashion, rather than with the revolutionary zeal that one might hope for. They've expressed regret if the ad gave the impression they were "taking the mickey out of people" (It didn't). The head of global marketing and communications is quoted as saying "We did not pay enough attention to the copy and the tone. Some people will call that out and we get that." As is the way of the modern world, they duly promised to learn from the experience and be "more careful" in future. Those Gammons out there (or in here for that matter) who might be tempted to say that any singleton who wants to change their status might be well advised to develop a Good Sense Of Humour should bear in mind that this ad was "intrusive" "tone deaf", and "not just something that triggers a few snowflakes on the London Underground." "A meal for one, that's a perfectly valid life choice," she added. "It's not their business to be shaming anyone for making that choice."